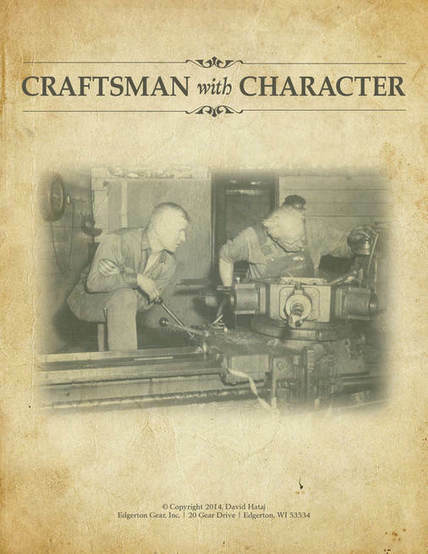 Craftsman With Character Course - Edgerton Gear, Inc. The Crisis – Young people are not entering Skilled Trades fast enough to replace an aging workforce. Solution – Craftsman with Character course – A 16 week job shadowing course in partnership with local high schools and businesses to introduce students to career options in the Trades. The "Craftsman with Character" course is 80% job shadowing in a real-world manufacturing environment and 20% classroom instruction that helps students explore the role of character in a professional trades environment. 1) To expose students to the world of high-tech manufacturing and other skilled trade professions so they can make an informed decision of whether this is a profession they may want to pursue as a career. 2) To develop their soft skills so they are employable in any job environment. These soft skills may be as simple as making eye contact, having a firm handshake, and dressing and acting in a professional manner and, on a deeper level, exploring virtuous character qualities that are necessary in becoming a highly skilled craftsman or craftswoman. These objectives are achieved with an emphasis on mentoring relationships as the students spend the majority of their time in the shop, job shadowing accomplished professionals. These mentors not only show the students a complete overview of their trades and processes, but take a sincere interest in the student’s development.